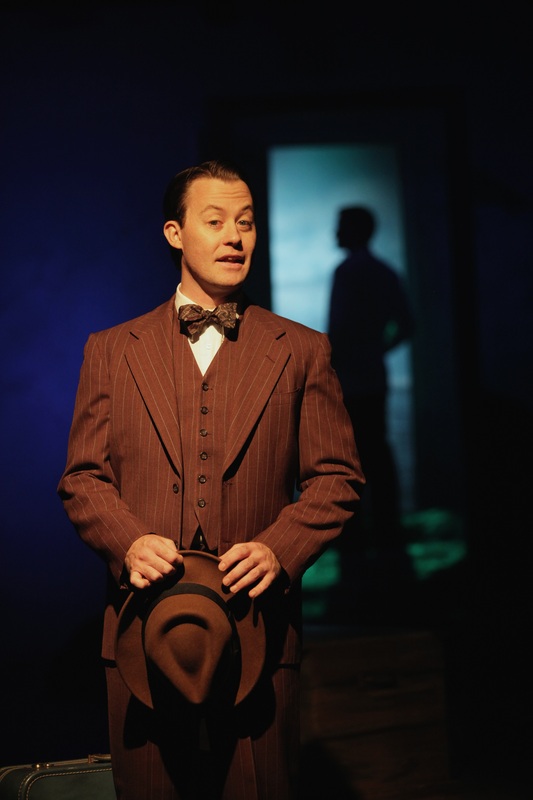 Justin McCombs as Nick Carraway in Cincinnati Shakespeare Company’s production of F. Scott Fitzgerald’s “The Great Gatsby” adapted for the stage by Simon Levy. Playing September 5- October 4, 2014, directed by Brian Isaac Phillips. Performances are located at CSC’s Theatre, 719 Race Street in downtown Cincinnati. Tickets and subscriptions are available online at cincyshakes.com or by calling the box office 513.381.2273. Photo by Mikki Schaffner. I have never read the classic novel by F. Scott Fitzgerald nor have I seen the recent movie adaptation. In fact, I knew nothing of the story of THE GREAT GATSBY before attending the sold out performance of Cincinnati Shakespeare Company’s latest production tonight. What a story it is! 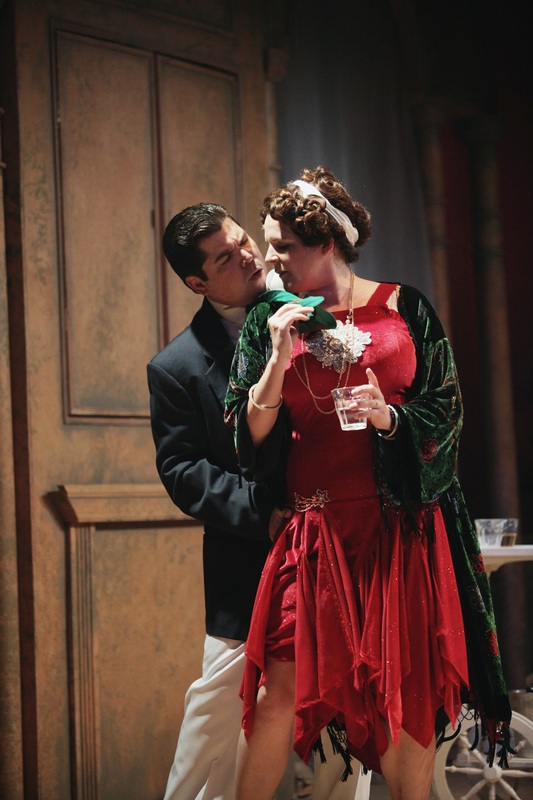 We meet “Nick Carraway,” played with refreshingly dialed-down charm by Justin McCombs, who narrates this ultimately tragic story of love and loss. We meet his cousin “Daisy” (Sara Clark), her sophisticatedly brutish husband “Tom” (Billy Chace), and their friend and professional lady golfer “Jordan” (Kelly Mengelkoch). We learn a lot about these characters quickly through sharp dialogue and wonderful interplay. They’re living in excess and its clear that they are pretending to like one another for the sake of appearances. It’s not long before we’re introduced to the mysterious “Jay Gatsby,” played with exactly the right tone, by Jared Joplin. Joplin first appears in powerful and stunning silhouettes, which only added to the mystique. Later we find out that he’s not as much mysterious as he is desperately, hopelessly in love with a woman from his past. A woman who he may not be able to have. But he is cunning, but also blinded by passion. The cinematic staging by Brian Isaac Phillips is impeccable; there were several times that the stage pictures took my breath away. In fact, this is the best production I’ve seen from these folks in my few years of attending. The use of the technical elements in this show takes it to a whole new level from what I’ve experienced at CSC. Credit the fantastic Andrew Hungerford for lighting and set design as well as the always great Doug Borntrager for his sound design. The soundtrack accentuates the important moments in addition to giving the show a sense of time and place. The video projections on the surprisingly minimalistic set are very well done. I am impressed. The performances are outstanding. I thought ensemble members Caitlyn McWethy and Josh Katawick practically stole their scene with McCombs in Act One. Nick Rose is low-key and I feared he was underused until the story develops in Act Two; his calm acceleration into the climax is a true highlight. Clark is as good as always, as is Mengelkoch, Miranda McGee and Jeremy Dubin in their respective roles. Perhaps my favorite performance is that of Billy Chace. He has the difficult job of taking a most unlikeable fellow and making him seem almost sympathetic. I felt empathy for a man so caught up in his own delusions and denial that he can’t see just how disgusting of a person he truly is. Both Chace and McCombs are known for their comedic chops; its refreshing to see them get to play it (mostly) straight for a change. Joplin, as I stated earlier, is pitch-perfect as Gatsby. In a novel, you get to see layers of characters that you might not have time to develop on stage. Leave it to the professionals to mine those layers and bring multi-dimensional performances to life. Joplin is masterful at doing so. I strongly recommend that you get tickets for this marvelous production now. Do not wait; it will sell out. There were many folks at tonight’s performance who it appeared had never darkened the door of CSC before; the beloved title will draw them in but I think the quality of this production will bring them back. Seeing this production makes me want to read the classic novel. I can’t think of a higher compliment than that. THE GREAT GATSBY runs through October 4th at Cincinnati Shakespeare Company on Race Street in downtown Cincinnati. Tickets and more information can be found here.